Walgreens has the deal for you today if you have already have taken a lot of summer photos. 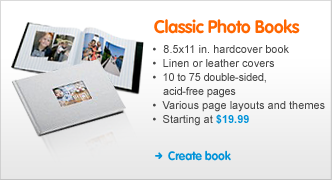 Today only use the couple code CREATEBOOK to get a FREE 8.5 x 11 photo classic linen photo book. There is a limit of only one free book per customer and does not count for additional pages. Order must be in by 11:59 CST to qualify. Orders also must be online only. Also today use the coupon code STRIPES and get 40 FREE prints when you order 40. Time to print all of those 4th of July photos! Thank You and 100 Giveaway!! Fashion Designer in the Making? But I don't wanna do it!! Did you get your FREE Slurpee today?